If you got the OOPS wrong place feeling after reading the intro, stay here and try to find out more about LocoNet. Especially if you are having problems getting sensor events under all circumstances. If so, the LocoNet concept will help you out of it. The module address is composed from the Low and Sub address and defaults to 81/1. The range for both is 0-126. The address on the General Tab is used for all further Tabs. Low-Address + Sub-address can be out of the range from 1 to 126. This address can also be changed by double clicking on one off the Adress List entries. It is not possible to change the Low and Sub address at the same time; change them separately. 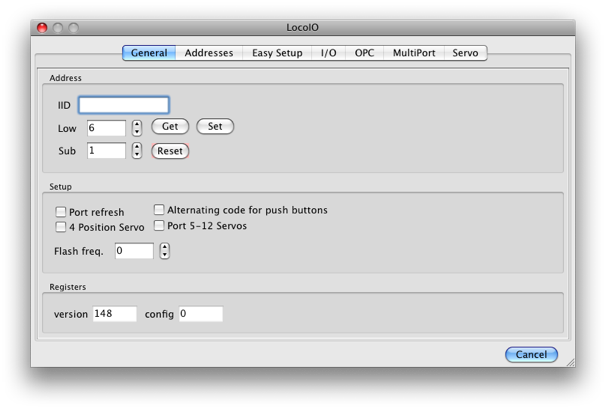 With reset all connected LocoIO based module will be programmed with the address 81/1. This is only needed if the address is unknown or the module does not react on commands. Make sure only that module is connected to the LocoNet! Only the address registers are overwritten at this point. But if more than one units are listening to this address all further modifications will take place on all of them! So take care! As alternative all available addresses can be listed with the Query button. For more details read the description of the address tab of this dialog. The opcode OPC_PEER_XFER is used to exchange data between computer and decoder.